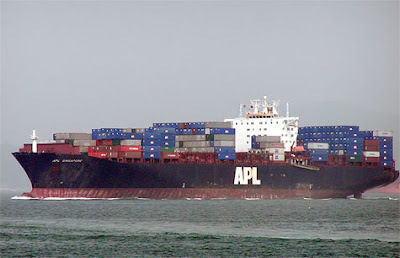 This weekend, as part of San Francisco's Festival of Sail, we'll get a chance to board and tour the 863-foot container ship APL Singapore. I'm not sure why, but this excites me a whole lot. You'll have to write a few words on that adventure. I'd be more "apprehensive" than "excited," personally. I don't know if I think that because of the size, the mass of goods in one place, or what. Disappointed was just the start of it.